Set your calendar! 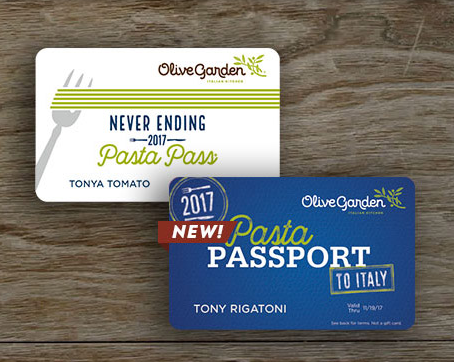 Tomorrow (9/14) at 2PM CST, Olive Garden will offer their Never Ending Pasta Individual Pass but it is only available for just one hour and to the first 22,000 people! An Individual Pass is priced for $100/person which includes 8 weeks of unlimited Never Ending Pasta Pass meals for a single Passholder plus unlimited soup, salad and breadsticks. These passes will be valid from September 25th – November 19th, 2017 for dine-in only.